Welcome to my second guide to the new 5 man dungeons in 4.3, The Well of Eternity a short NPC led dungeon with 4 bosses and 3 encounters and during the instance you’ll be transformed into a Night Elf. As you’d expect with it being centred around a major lore event you’ll get to meet and assist major lore figures. As you enter the dungeon you’ll need to kill a large demon before meeting you’re dungeon guide for the day Illidan Stormrage, yes THAT Illidan! your task now is to get across a courtyard full of demons and destroy 3 crystals, fortunately, Illidan gives you a stealth buff to get you through the masses of demons so you’ll only fight a trash packs near the three crystals. 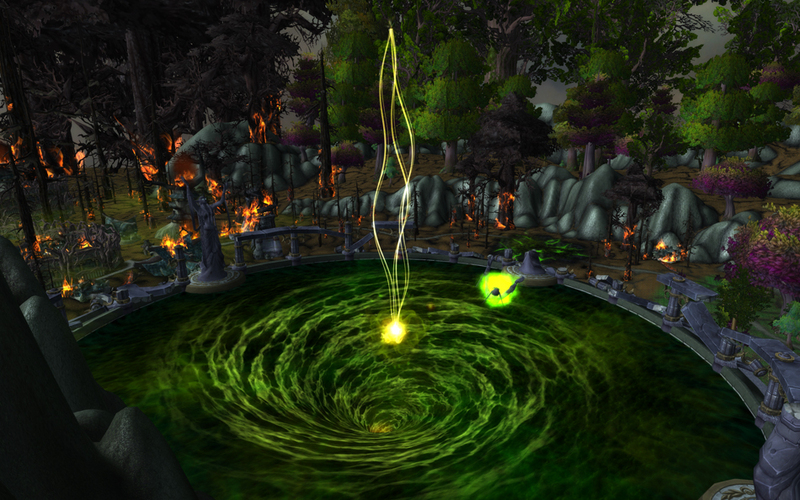 Once you have destroyed the third crystal the boss, Peroth’arn will spawn. After killing Perotha’rn, Illidan will disappear, fight the trash packs as you go up the stairs, spread out to avoid the nasty chain lightning attack the eyes do type of ability and should be killed one at a time. The Highmistresses will make two copies of one of your group, kill the Highmistress as a priority. When you reach the top, you’ll see Queen Azshara and some adds. Make sure someone interupts Azshara’s Total Obedience, it’s an 8 second cast so no excuses DPS types! If Total Obedience is cast, everyone will be mind controlled for 20 seconds. Once all the adds are dead, you’ve won the fight and you get an RP scene, it is quite long and leads you to the Well of Eternity and you meet up with Illidan again and also be joined by Malfurion and Tyrande. You now have a short trash gauntlet and you can use Tyrande’s moonwell for help and standing near Illidan will give you a buff which will help kill the trash a bit faster. AoE teh bats and you’ll start the last boss fight against Mannoroth and Varo’then. Varo’then is pretty tame and will spawn Dreadlord Debilitators just before he dies that stop Tyrande from dealing with the demons, the DPS should stand in the moonwell and help her by killing the Debilitators and the demons. All that is left now is to loot, watch the RP scene and move on to the last of the 4.3 dungeons, the Hour of Twilight. If you have any comments, corrections or amendments to this guide please leave a comment below. Posted in Allsorts Tagged 4.3, cataclysm, Dungeon, guide, healing, strategy, Well of Eternity.